In 2011 I picked up a copy of the David Briggs Messe pour Notre Dame, a recording that received rave reviews and personally blew me away. I reviewed that disc on Amazon back then and said I couldn’t wait for someone to record his other Mass, “Messe pour Saint Sulpice”. Well here it is, and it has been well worth the wait. The disc is presented as a 50/50 split between two British organist-composers, Jeremy Filsell and David Briggs, both of whom now work Stateside, and this creates a lovely contrast of styles. Briggs’s beautiful anthem “Pange Lingua” opens his half of the CD in what is a true virtuoso performance of a rich, vibrant and complex anthem – commissioned and premiered by Vasari Singers and a real highlight of the CD. Following that is a short organ improvisation by Briggs, before the above-mentioned Briggs Mass concludes the recording in stunning style. The opening half of the CD is taken with the music of Jeremy Filsell, again featuring new commissions, and Filsell’s cycle of Morning and Evening Canticles (Te Deum, Jubilate, Magnificat and Nunc Dimittis) written for the choir of Windsor Chapel (where Filsell used to sing). The Te Deum in particular stands out with it’s Walton-esque references, intricate organ colour and floating soprano lines. 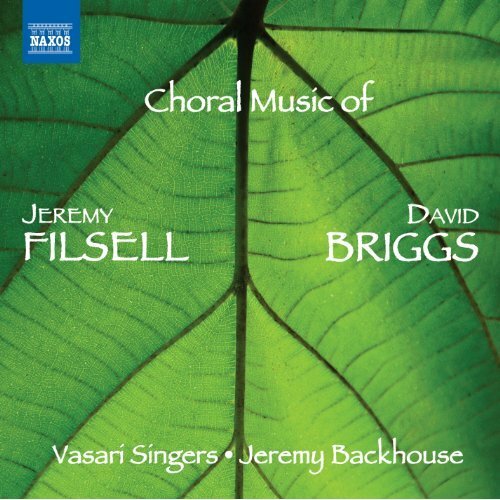 The Vasari Singers excel on this recording under Jeremy Backhouse’s direction and the audio quality is absolutely superb, with a wonderful balance between choir and organ throughout. Interesting to note the Producer Adrian Peacock also produced the Notre Dame mass so he must have an ear for Briggs’s music.